Just need the recipe? 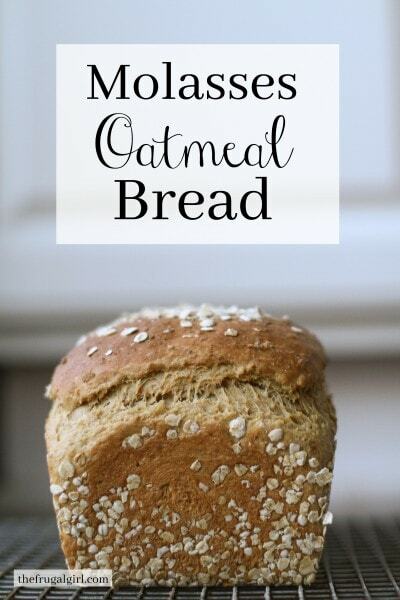 Click here for a printable Molasses Oatmeal Bread recipe. I made this bread a few times back when I was a teenager, but I’d kind of forgotten about it. One day recently, I was needing to make some loaves of bread and I felt like I wanted to make something a little different than my usual whole wheat bread. 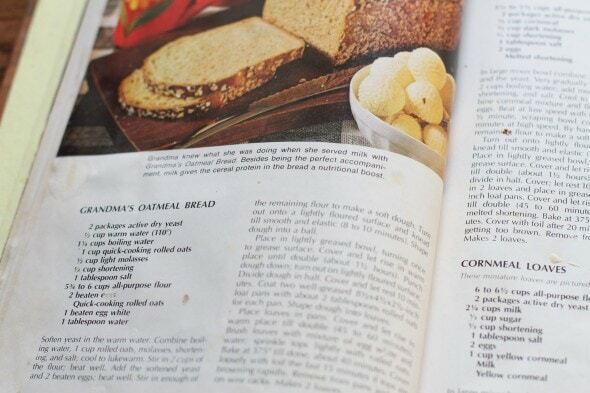 So, I flipped thru my vintage Better Homes and Gardens bread cookbook and came across this recipe. My kids all really liked it, and it was a nice change from our usual loaf. I have to admit, it’s probably not quite as healthy as our usual bread because it’s hasn’t got nearly as high a percentage of whole grains in it. And it contains a pretty hefty amount of molasses which is just liquid sugar. But still, it’s not exactly junk food, and it IS really yummy. You could definitely substitute whole wheat flour for part of the white flour if you’re feeling virtuous, but I’m not sure I’d go 100% whole wheat. Oatmeal tends to make the dough a little heavy to begin with, so using at least half white flour will help your loaves to not be overly dense. To make this bread, you combine quick-cooking oats, molasses, butter, and salt, and then add boiling water. This softens the oats, which makes a lot more palatable in your bread. And it has the handy side benefit of melting your butter! Stir and then let the mixture sit until it’s lukewarm. Meanwhile, in a mixer bowl, dissolve the yeast in warm water. Once the oats are lukewarm, add cooled oats mixture, 2 eggs, and 2 cups of flour. Beat for 3 minutes, then stir in enough of the remaining flour to make a soft dough. 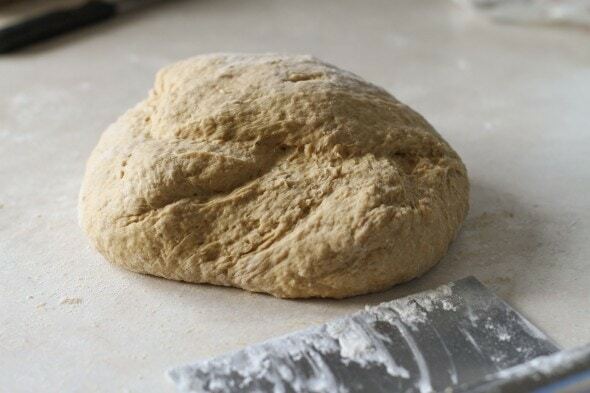 Turn the dough out onto a floured surface and knead by hand for 3 minutes, or until the dough is smooth and elastic. 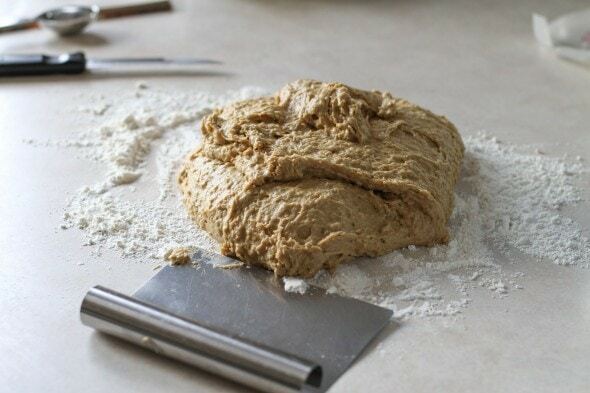 If you prefer, you can finish the kneading in your mixer. Or if you don’t have a mixer, stir the dough well by hand, and then turn it out onto your counter and knead it by hand for 5-8 minutes. The molasses makes this dough a little on the sticky side, so don’t fret if your feel like your dough is more tacky than usual. Put the dough into the mixing bowl, cover it with a wet tea towel, and let it rise for about an hour. 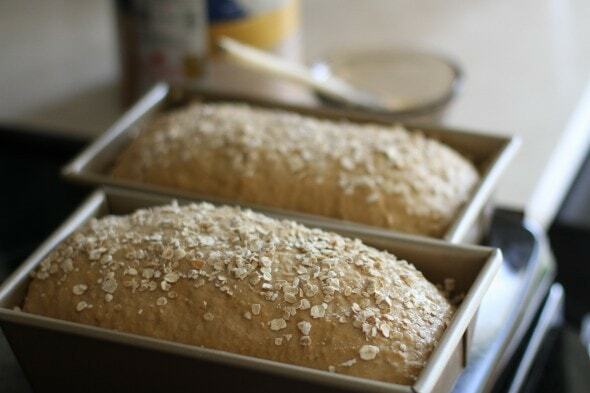 While the dough rises, grease two 1-pound or 8×4 inch loaf pans, and sprinkle each pan with oats. It’s kind of like greasing and flouring a cake pan, except with oats. When the dough has finishing rising, dump it back out onto the counter, divide it in half, and roll each half out into a long rectangle. Starting from the short side, roll the dough up, and place the loaves in the prepared pans, seam side down. Cover ’em with a wet tea towel again, and let them rise for about 30-40 minutes, or until they’re doubled in size. Before the loaves are done rising, preheat your oven to 375° F so that it’s hot and toasty before you put your loaves in. Yeast bread loves a hot oven! A cold oven, not so much. 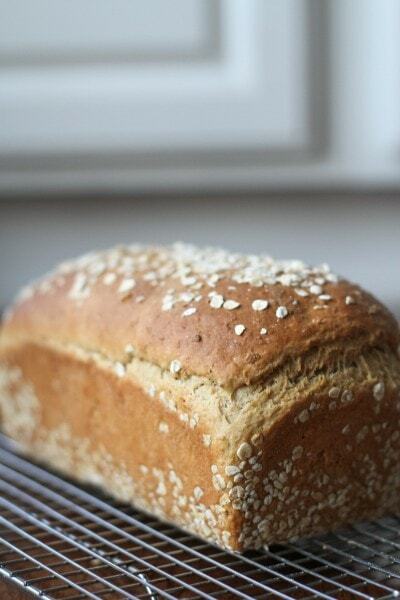 Before you bake your bread, brush a bit of water on top of the loaves and then sprinkle with more oats. This is really just for looks, so no worries if you want to skip it. 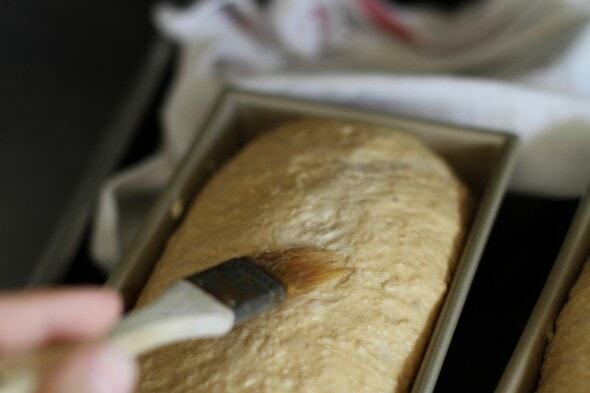 Bake your loaves for 30-35 minutes, or until they’re nicely browned. Remove them from the pans and let them cool on a wire rack. 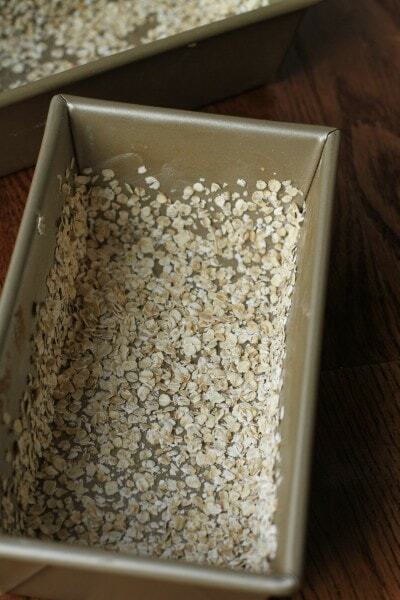 Some of the oats will fall off as you remove the bread from the pan, but most of them will stick. Just be prepared for a small mess. This bread stays soft for several days, but you should do yourself a favor and eat a slice or two while it’s still warm from the oven. 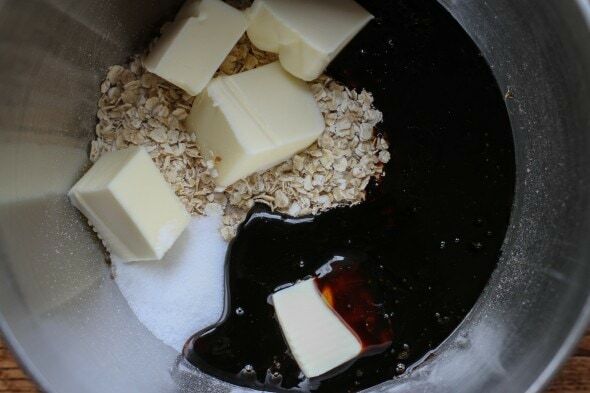 Combine oats, molasses, butter, and salt in a bowl. 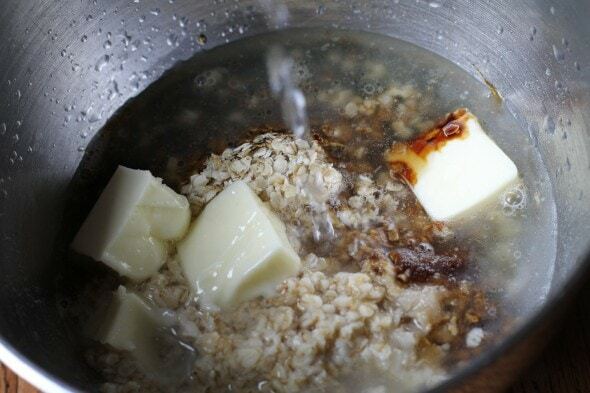 Pour boiling water over oats, stir to combine, and let mixture cool to lukewarm. 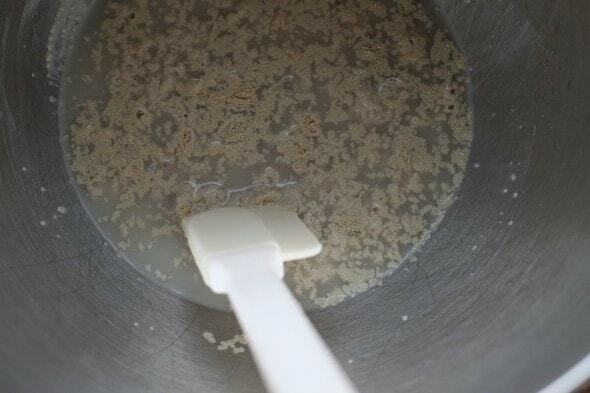 In a mixer bowl, combine warm water and yeast. Let sit for a few minutes, then add lukewarm oat mixture, 2 cups of flour, and 2 eggs. Mix until combine, then beat for 3 minutes. Add enough remaining flour to make a soft dough, then turn out onto floured surface. Knead 3-5 minutes, or until smooth and elastic. 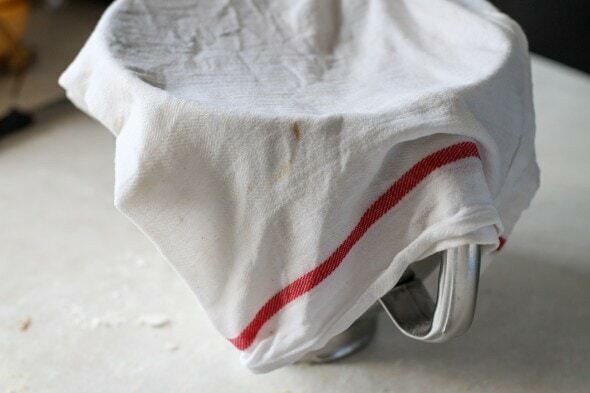 Place dough in bowl, cover with wet tea towel, and let rise in a warm place until doubled, about an hour. Grease two 1-pound (or 4×8 inch) bread pans; sprinkle with oats and tip pan to cover sides and bottom. Turn risen dough out onto lightly floured surface; divide in half. Roll each half out into an oblong shape and roll up, starting with the short end. Place loaves in prepared pans, seam side down. Cover with wet tea towel and let rise in a warm place until doubled, about 30 minutes. 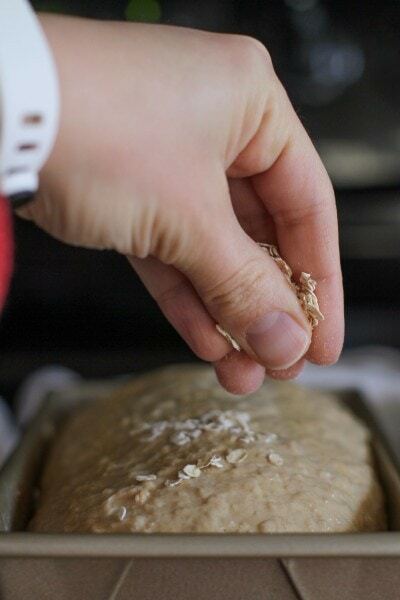 Preheat oven to 375° F. Lightly brush tops of risen loaves with water, then sprinkle with oats. Bake for 30-35 minutes, or until nicely brown. Remove loaves from pan and let cool on a wire rack. Yum. Kristen I am dying while I wait to live through the four weeks of the Fodmap diet. So much is banned. So hopefully when I do the food challenges I can eat more. I am busting to make this bread. Thank you for sharing it with me. FODMAP can be so helpful–stick to it! Nutritionally speaking, this is a good bread. Oatmeal is always good. Molasses has several vitamin/minerals, and 1/2 cup spread over 2 loaves is not that bad. Can’t wait to try it! yeah and molasses has iron, right? Ohhhh my gosh, that bread looks sooooo tasty. I need to use up a ridiculous amount of old-fashioned oats, so this’ll be a great addition. Now I just need to locate a darn bread pan. Like a fool I donated mine a few years ago since I “didn’t need it.” Ugh. I do have silicone molds for mini loaves, but the downside is they’re not that great on sandwiches. Do you have a round cake pan? You can do round loaves in them. Looks so good! A week or so ago, I made Oatmeal-Molasses rolls (recipe here: https://food52.com/recipes/8298-heavenly-oatmeal-molasses-rolls). I’d originally gotten the recipe from a library book. The kneading and rising is different than normal bread/rolls. These were SO good but unfortunately when I put them in the oven, I lost control of the pan and it dropped into the oven with a huge “thunk” which made all the rolls sink and created a very dense bottom to them. Next time I won’t drop them into the oven. I stopped buying bread from the store because it’s either expensive and still has ingredients in it I’d rather not consume, or more affordable but even more full of ingredients I’d rather not consume. But I haven’t actually baked bread to replace the bread I’m not buying so we’ve been a breadless household lately. I should rectify that! Crisco has been reformulated to use fully hydrogenated fats rather than that heart-attack-causing partially hydrogenated fats. So now it’s only about as unhealthy as butter instead of much less healthy. But still – why use neutral-tasting Crisco in bread when butter makes bread taste so good? This looks amazing. I am totally going to try it when I get over my flu! 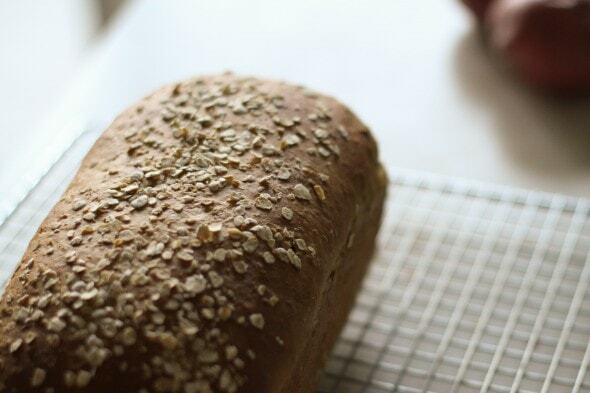 I make a similar bread (from an old Amish cookbook) and it’s my family’s absolute favorite! I get the mom-of-the-year award when I make it. In my recipe, an option is given for using honey or brown sugar in place of the molasses, but hands-down, molasses is the tastiest option. I must admit, I was a little surprised you can just sub butter for Crisco, but I suppose that makes sense. This looks like a recipe I’d like to try! In a situation like this where you’re just melting the fat, pretty much anything will work…solid fats, liquid fats. But of course butter is the tastiest option! 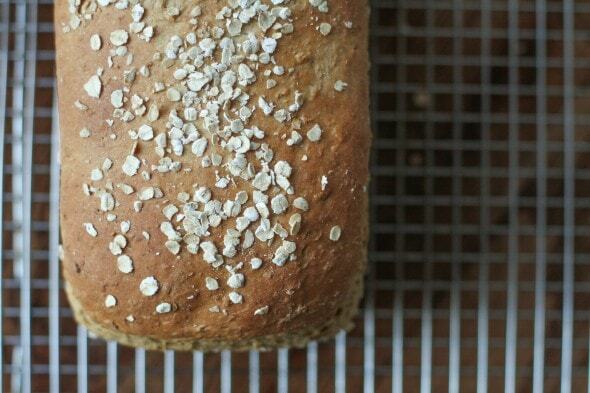 My mother used to make oatmeal-molasses bread from her old, old BH&G cookbook recipe. I don’t know how old, but I remember her using that cookbook in the early 60’s. She would have a warm loaf coming out of the oven sometimes when we would get home from school on cold, snowy days, and would have the butter sitting out, softening, to spread on a slice when the loaf was barely cool enough to cut. Just like the cliché, we walked in the snow to and from school, but it was only a few blocks, not 10 miles uphill, and we weren’t barefoot :), but we would definitely be ready for that warm, luscious bread. Oh, now I need to make some. I substitute butter for Crisco in my baking, too, except I sometimes make plain old vanilla cupcakes (also from BH&G) with coconut oil instead of butter, and whole wheat pastry flour in place of all the white flour. For some reason, the cupcakes taste spiced when I do that, but the only flavoring is the vanilla. I still haven’t figured it out, but everyone loves them. When our dad would take us to a farm down the road from my grandfather’s farm, to watch the cane grinding and buy a gallon pail of molasses, I would get so excited, thinking about that oatmeal-molasses bread, baked beans, gingerbread, and our favorite dessert, corn bread smeared with molasses and butter. Okay, now I’m really hungry. I made this recipe this morning and we had it for lunch hot out of the oven….well, we waited 15 minutes:) I used half and half whole wheat and all-purpose white flour and divided the recipe into three loaves as my pans are a bit smaller. It was delicious! Thank you so much for the recipe! Such a treat on a snowy, blustery day. 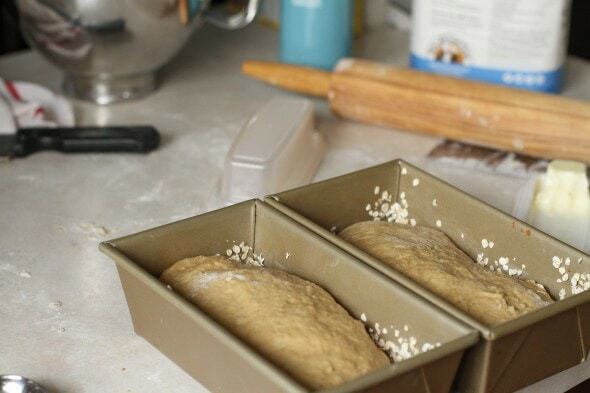 I”ve been putting off buying loaf pans, but I am going to order some tonight! This bread looks delicious. Salivating here and cursing my lack of yeast bread prowess! This looks amazing, and I’m going to try it this weekend! I like adding a bit of molasses to things because of the iron boost. Thank you for the detailed directions and pictures. Thanks for sharing, Kristen! This looks delicious and I’ll be glad to have a recipe to use up the molasses I bought for gingerbread before we move. I think I’ll take some to the new neighbors. Hey Kristen, this looks great! My brother and I both like to bake. We were talking about this recipe this morning but each have a different issue. I don’t have instant oats on hand. Do you think it would work with regular oats? My brother doesn’t have loaf pans. Do you think he could make this on a sheet pan? Thanks as always for the great recipes! 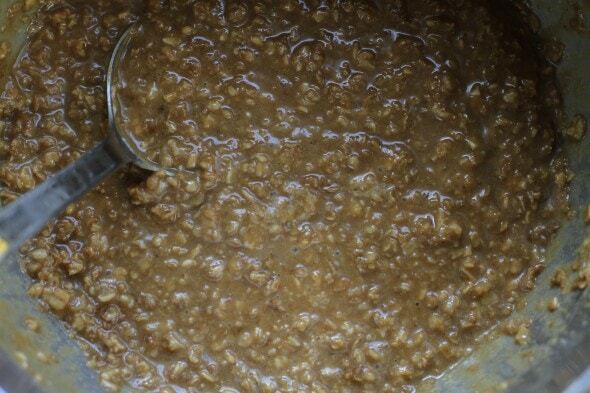 Yes, I think you could use regular oats. I think they’ll soften up fairly well in the boiling water. And yup, I think you could do this as a round, free-form loaf on a baking sheet. It would probably be beautiful! Thanks! We are both going to try it. I then baked them for around 50 minutes at what my inaccurate oven called 375 degrees (waited for bread internal temp of ~195), removing the lid of the dutch oven after 20 minutes. Here is the end result (the one on the left is from the dutch oven): https://goo.gl/Qh2pZW . The only obvious difference was the darker (and firmer) crust on the sheet cooked loaf. Both loaves were awesome. I had a slight preference for the one baked on the sheet as it had a crustier crust. One of my friends who tried it preferred the dutch oven one, though he could not say why. My other friend could not tell the difference. That’s so awesome! and super fun to see pictures. Your loaves look delicious. I see that Brer Rabbit makes a mild flavor variety, so maybe give that a try? It comes in a 3-pack on Amazon (http://amzn.to/2lDR8m5), but maybe you could find single jars locally. Just made this….perfection! Beautiful loaves, lovely bread. Has anyone tried steel cut oats? I would guess that they wouldn’t work very well without being cooked/soaked more than regular oatmeal. Either they’d end up as hard bits in your bread, or they’d soak up tons of flour in your dough, leaving you with a rather dry dough.